J.D. 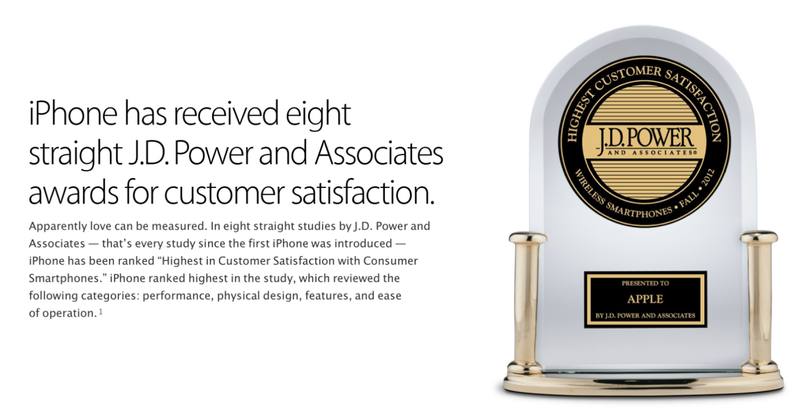 Power, which previously awarded the iPhone highest in consumer satisfaction for smartphones eight years in a row, today released a report that puts Apple on top for customer satisfaction by carrier. While measure four key metrics— performance, physical design, features, and ease of operation— across the four major carriers, J.D. Power found Apple and the iPhone’s overall score ranked #1 for Sprint, Verizon, AT&T and T-Mobile. However, in most cases, it’s only beating Samsung by a small margin. In addition, J.D. Power’s study included some stats on the most requested features that consumers want in new devices and surprisingly the upcoming iPhone’s rumored larger display didn’t make the list: smartphone owners most often cite seamless voice control (36%); built-in sensors that can gauge temperature, lighting, noise and moods to customize settings to the environment (35%); and facial recognition and biometric security (28%). Apple has several times used studies from J.D. Power in iPhone and iPad advertising on its website and in other marketing materials (pictured above). J.D. Power has ranked Apple highest in consumer satisfaction for smartphones eight years straight since the introduction of the first iPhone, but its process was questioned recently when it ranked Samsung on top for tablet customer satisfaction despite Apple ranking in higher in most categories other than pricing.